I covered a lot of kilometres yesterday, around 480, to get to a familiar and favourite place, Girona, an ancient city an hour or so north of Barcelona. I have been here a number of times, it has an extensive medieval barrio, rows of colourful apartments along the river, a sense of being here for thousands of years, from preRoman days, great museums and restaurants. I was going to relax for a few days, visit a few other familiar places and maybe some friends, and deal with my growing fatigue from travelling, of being away. But it is festival week in Girona. I had no idea. Serendipity! I am staying in a suburban hotel, 4 km from the centre, quite a change from the ancient tiny villages of the last 12 days. I took the bus downtown and arrived in the middle of festivities. 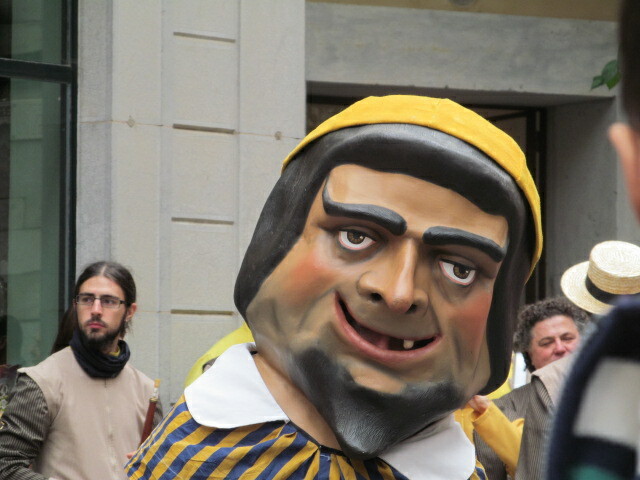 It is the festival of San Narcis, the patron of Girona. A bishop, martyr, from the 4th century who might have been born here of a noble family, but who might have preached in Germany. Legends. His tomb is in the cathedral. In the 13th century, forces from (what is now) France invaded and occupied the cathedral which at the time was outside the walls. The French thought of desecrating the tomb of this popular saint but it backfired on them. When they opened it, swarms of flies attacked them and chased them from the city, thus saving it. John Cleese probably knows this. I was wandering through the narrow streets, visiting favourite places, when I heard music. I do not know what it was all about as the ongoing narration was in Catalan, but it was fun. 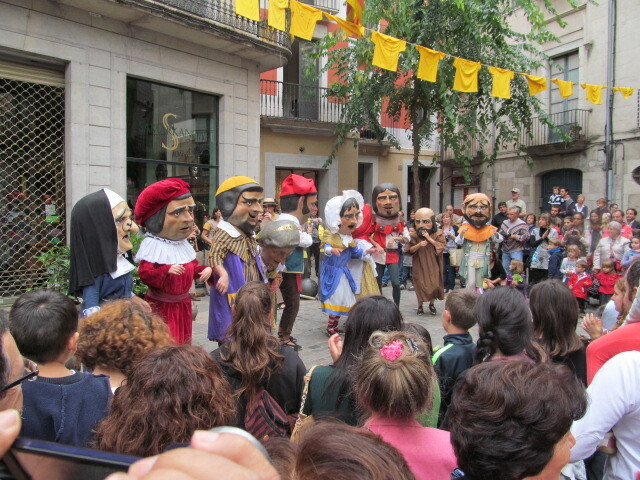 Masked characters, one with a giant fly on his nose, paraded through the streets, with a live band, followed by hundreds of delighted kids with their parents (holiday from school). I caught up with them when there were just three characters, the lad with the fly on his nose (he was also the storyteller), the monk and another. Every block or two, they stopped, continued telling the story and another character or two arrived. In the video above, there is also a soldier and a wealthy couple. 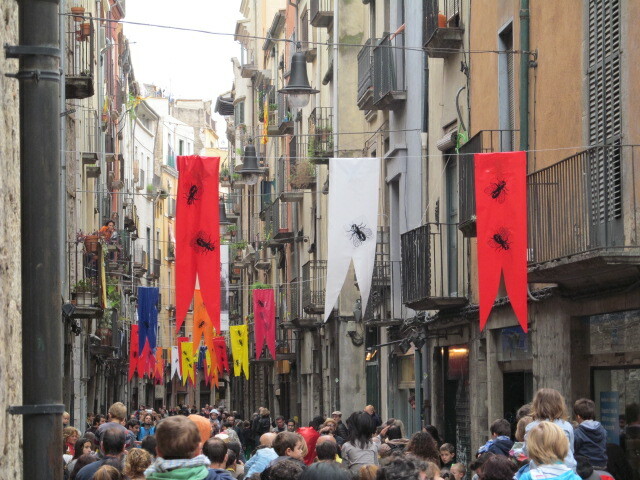 The streets are bedecked with fly banners. 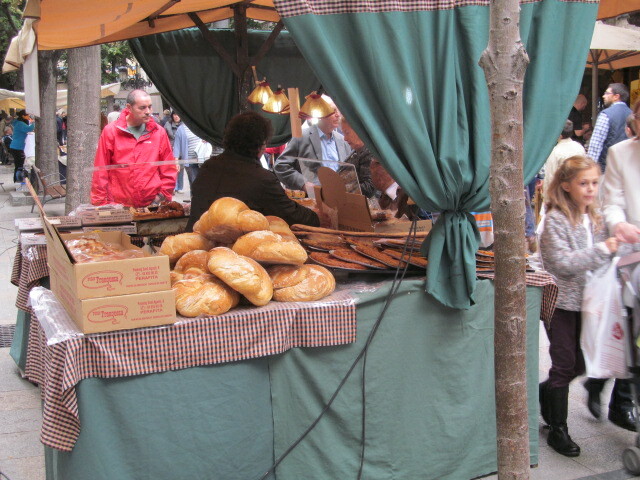 They eventually made it to the broader walking street, Las Ramblas, where there were booths set up selling cheeses, cured meats, breads and pastries, honey, etc. and many sidewalk cafes. 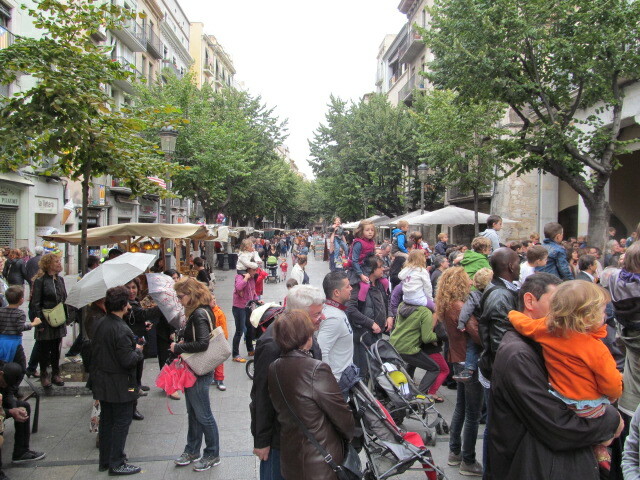 Everyone was having a very good time, not only the children, but the adult kids, most of whom were most likely from Girona, enjoying this annual tradition, and treasuring their own childhood memories, maybe even their first San Narcis. They continued to add characters, including a farm girl who threw cabbage leaves in all directions (hey, it was in catalan; I have no idea what was happening). Look at this bread! Oh for some of that fig jam from that farmhouse stay in Montblanc. The final two character were probably the mayor and an elderly nun. This brought the parade and the storytelling to an end (the moral of the story? don’t invite an elderly nun to your frolicking). Before I give you a second video, of the final dance, I want to show you my favourite face, that of the wealthy man; what a wonderfully smug smile – a medieval Donald Trump. He is carrying his money purse for all to see. In the morning, I am planning on heading into town, walking preferably through the many neighbourhoods, to find out the next two days’ schedule of special events. Staying around could be the best idea. This entry was posted in Uncategorized on October 29, 2013 by agnotarte. What a scene to be part of! You certainly wouldn’t find such entertainment here! Sure beats TV! Thanks for the blog. I am enjoying it very much. I’m interested in the instruments they are playing in the first video. They look like a recorder but with a double reed – could this be true? They do sound a little like a squawky oboe… Beautiful photos, Ed!